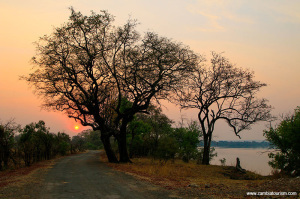 While it is true that Zambia lacks the spectacular mountains of most of its neighbours, it has more intact miombo woodland than any other country. It also has many large lakes and vast floodplains. The Zambezi and several of its tributaries are larger than any river to the south. There are larger and more spectacular waterfalls in Zambia than in the whole of the rest of the subcontinent, including five major waterfalls on the Kalungwishi River system alone.Zambia occupies a central position in the Zambesian Region, which is the summer-rainfall belt of southern tropical Africa. Within the region the natural vegetation is largely determined by altitude, rainfall and soils.Common NamesIn countries where the English language has been in use for centuries, such as the United States, South Africa and Australia, many plants are known by common English names. Zambia has a vegetation quite different from those countries and very few species have accepted English names. The tendency to borrow names like “Wild Medlar” is of little help to local Zambians who are never likely to see a medlar, and would not recognize the similarity if they did. Ecologists in this country have preferred to use one of the local names. There is no problem with “mopane” or “baobab”, which are established internationally, but there seems little point in coining a whole new system of names when all plants already have very specific botanical names. It is true that the Latin names can be difficult to get your tongue around, but are essential to be sure of exactly which wild fig, for example, you are looking at. Knowing the botanical name will allow you to find out the local name.